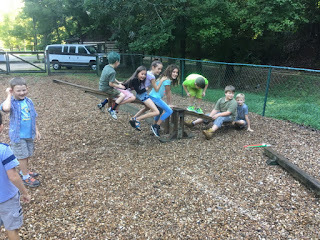 A see saw is such a simple thing. You put one kid on a side, and then others join, and it is a source of amusement through which a certain amount of information is conveyed. Yesterday at times as many as 9 or 10 students were on at a time, testing the strength of the construction. "If I add my weight to this side, what will the results be?" The see saw is a piece of play equipment that our students requested a couple years ago and then helped build. Yesterday I began work on large Froebel blocks to be used on the playground in building instructional forms. The first blocks are gift number 3 consisting of eight 2 ft. x 2 ft. cubes that my students will help construct. We have a number of new students this year, so I will have my work cut out for me in learning names and understanding abilities. My own classes in the wood shop will begin on Tuesday. Make, fix, create, and increase the likelihood that others learn likewise. In Denmark the children started 3 weeks ago, so I think that the holiday in the US is a bit longer. It is a good sign when the children actually look forward to going back to school. Our local public schools had started about 2 weeks ago, being on a different schedule, and required to have students in seat time for a certain number of hours. Our independent school is held to higher standards and all the kids were excited to be back. We have a number of new students that are getting to know the routines. gathering to do good work. the reprise of the pen.